The golden orb spider is an areneomorph spider, part of the genus Nephilia. The golden orb spider’s suborder is best known for the impressive webs that they weave. Nephilia consist of numerous species all around the world. We are interested in this spider due to the amazing properties of it’s silk and the possible applications thereof. In the golden orb spider weaving group, it is very common for tiny male spiders to sit on the edge of the female’s web waiting for a mating opportunity to occur. 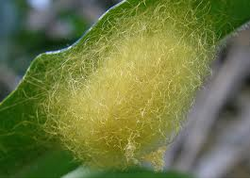 After mating, the female wraps her eggs in a sac of golden silk, which is then hidden away in the foliage, usually wrapped in leaves or twigs.